4 Types of Regenerative Medicine Treatments: Prolotherapy, Platelet Rich Plasma Therapy and Percutaneous Tenotomy - Piedmont Physical Medicine & Rehabilitation, P.A. 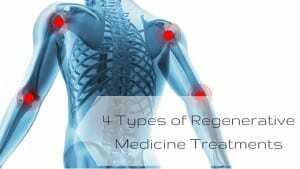 Before regenerative medicine techniques are initiated it is best to have a medical doctor evaluate the root cause of the problem. Often underlying conditions are present that affect healing. For example, a patient with diabetes or early peripheral arterial disease will not heal as quickly as someone without those conditions. Likewise, a torn rotator cuff in the shoulder or an osteoarthritic knee may be associated with a strained ligament in the neck or a nerve irritation in the low back. Quite often treating the spinal component will improve the results of treating the injured limb. That means the whole body should be evaluated, not just the area of most obvious interest. If muscles are inhibited, tight or weak a functional restoration program to re-educate, stretch and then strengthen should occur. Diagnostic musculoskeletal ultrasound, segmental plethysmography and arterial duplex studies are three non-invasive and non-ionizing tests that can both illustrate and detect the presence of injury or disease. Depending upon the severity of findings results can be used to formulate a focused treatment plan. A very powerful tool to re-grow, or proliferate torn or stretched muscle, tendon and ligament is prolotherapy. Prolotherapy is a technique where medications are injected into an injured musculoskeletal body part with the intent of regenerating tissue. The goal is to strengthen ligament structures to relieve pain. The healing of a wound has been divided into three phases: inflammatory (early and late), granulation tissue formation, and matrix formation and remodeling. Inflammation is the reaction of living tissues to all forms of injury. It involves vascular, neurologic, humoral, and cellular responses at the site of injury. Various compounds are used in the treatment, but we prefer a combination of Xylocaine and Sodium Morrhuate. When injected into the injured body part it stimulates local prostaglandin production – or in simpler terms, wound healing. Essentially, prolotherapy is a natural way of telling your body’s natural wound healing response to come to an area and aid it. Injections are often done on an average of three times over several weeks. Biopsies have been done and confirm the creation of organized tissue (not scar formation), and after the third injection a 40% thickening can be expected. For more severe cases, or in instances where a faster response is needed, a plasma rich platelet treatment can be done. What is a Plasma Rich Platelet Therapy? PRP is an autologous (derived from the same individual) blood therapy that stimulates your body’s natural healing process through the injection of its own growth factors into injured areas. The process involves drawing blood, spinning it down to separate out growth factor rich platelets, then injecting the platelet rich plasma into the injured area. To make the injection more comfortable, local anesthetic or nerve blocks are performed first. Often, following a PRP injection, an “achy” soreness is felt. This “soreness” is a positive sign that healing has been set in motion. The soreness can last for several days but it gradually decreases as healing and tissue repair occurs. Depending on your response to treatment, one to three PRP injections may be required. Following the initial treatment, a follow up visit will usually be scheduled within 2-3 weeks. At that time a decision may be made regarding the need for additional treatment. In general, chronic or severe injuries require more treatment than mild injuries. Restorative therapy including exercise or physical therapy may be prescribed as well. And for those who suffer from tendonitis and tendon related pain, there’s percutaneous tenotomy. Ultrasound guided percutaneous tenotomy offers a new and innovative technique for treating tendonitis and tendon related pain. With the use of Diagnostic Ultrasound for both localization and needle placement, a percutaneous tenotomy (tendon repair through the skin) can occur. This omits the need to perform an open procedure (there is no surgical laceration). This outpatient procedure also saves facility and anesthesia related surgical costs. Excessive repetitive strain of the tendon is thought to be a major influence in the etiology of tendonopathy. Traditionally, tendonosis (implying non-inflammatory tendon swelling or degeneration) is thought to occur with overuse, causing microtrauma at a degree and frequency at which the tendon can no longer heal itself. This situation leads to mechanical breakdown of the tendon. With diagnostic musculoskeletal ultrasound, tendonosis is readily identifiable. After appropriate consent is obtained, the area is properly cleaned and a needle of suitable gauge and length is inserted through the skin. As you can see, there are different options for different conditions. Some are more within a patient’s comfort range than others, but they should not be overlooked as they can provide extraordinary results. If you would like to book a consultation and see if one of these treatments is right for you, contact us here.